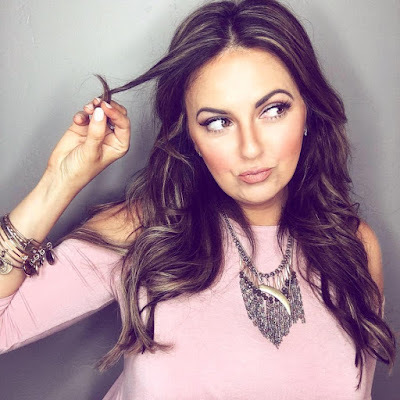 This week has felt long, yet it is time for another Friday blog post!! Here we go -- cell phone shots of the week.. in review..
James picked up a little tub of salsa from our favorite Mexican place by his old house.. Los Voqueros. This is love people. $8 to make me very happy. I didn't get enough though.. I could drink this stuff. James got me this Old Navy sweatshirt for Christmas, and I think it's cute and funny. 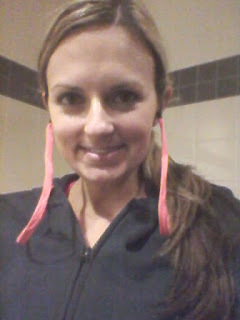 It has headphones in the hoodie strings, and you can plug your phone or iPod in down in the pocket! I had to text him this pic from the gym and show it to him. 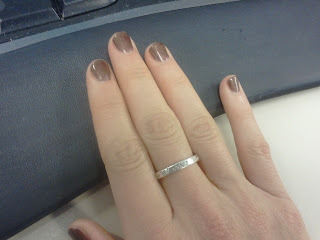 Ooh, I finally got a mani pedi on Monday -- day off from gym. I always hate going because it takes so long, but I needed it and I got some gel color, which has lasted all week! I love it, but it was a long process to put on, and probably a long one to take off. And my foot massage lasted forever, so it was def. worth it! 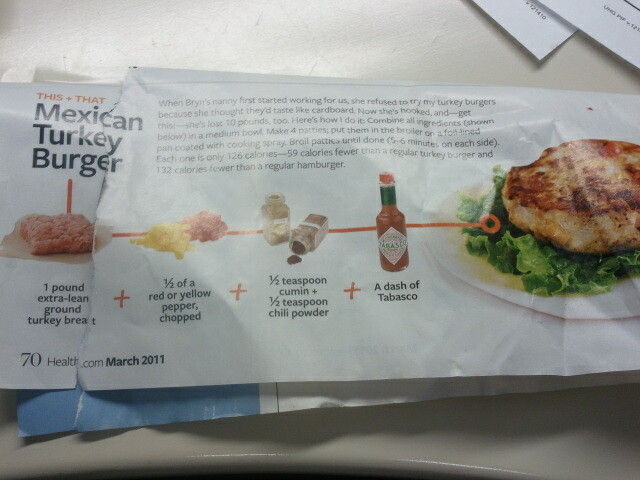 James made me some "Mexican Turkey Burgers" - we got the recipe in a magazine -- for lunches this week. 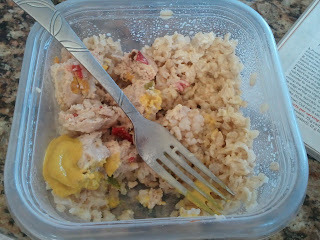 Top with yellow mustard, put on top of some brown rice, and pretty good! 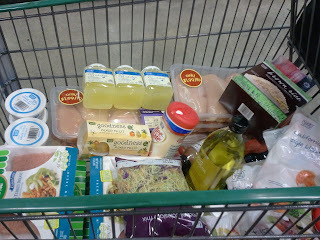 Healthy eats shopping cart from Fresh & Easy last weekend! I bought SO much chicken and turkey -- like 6 or 7 packs of each, and the same of tubs of egg whites and yogurt. I paid with 2 separate bills ($100 ish each one), and used 2 coupons for $10 off on each bill! So we saved about $40! I love those coupons. 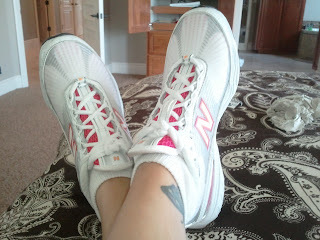 Went to lunch with my mom on Monday (got a "Naked Chicken Salad" at Sharkys), and she brought me new kicks! Love surprises, and these New Balances were on sale for $25. Thanks Mom, I love them! Got my 1st 2 pairs of Lululemon shorts on eBay -- both size 8 (Canadian sizes run small? I usually wear a 4-6) -- and fit pretty good. The stretchy ones are kind of short. I want some capris, but they are so $$$ and I haven't found a good pair on eBay yet. But here ya go! 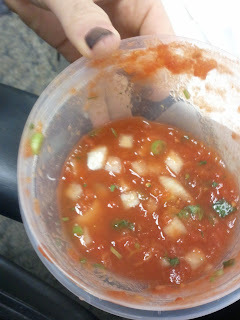 The salsa looks great and salsa and chips is a great snack. Thanks for the great blog with awesome ideas. Looking forward to your next post!